Emotional Intelligence Training Materials are designed for trainers to develop emotional intelligence awareness in the workplace. Train your employees and managers how to validate their emotions, how to set personal views, consider strengths and talents, the seven human emotions and more! Seeing is Believing This sample manual to teach Emotional Intelligence is in MS Word format. Wondering how to go about teaching emotional intelligence? Curious about the relationship between emotional intelligence and the workplace? Velsoft’s one-day emotional intelligence workshop teaches the essentials of emotions, from how to recognize and manage them, to the value of the EI blueprint, and more. Students learn the essence of emotions for themselves and others, the relationship between emotional and physical health, and learn techniques to understand, use, and appreciate the role of emotional intelligence in the workplace. Whether it’s training for teachers, managers, or leadership skills, emotional intelligence helps anyone who wants to learn how to lead, inspire ,and connect with their team. Training in emotional intelligence is made even easier for instructors with Velsoft’s fully customizable training material, which includes pre- and post-course assessments, emotional intelligence examples, activities, and training tips. 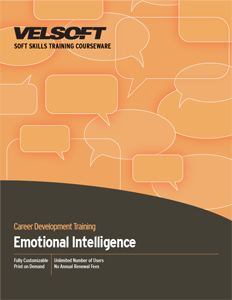 Emotional Intelligence is also available through Velsoft’s eLearning format, which can be used in combination with the traditional instructor-led material to help trainers and students get the most out of their courseware as part of a blended learning format.